At the National Council for Science and Faith (NCSF), we believe that there is nothing problematic with people of faith accepting science and remaining grounded in their faith. We reject the false dichotomy that one must choose between acceptance of science and being faithful. As a person of faith trained first in my faith tradition, Christianity, then educated in philosophy, and then further educated in geology, I have learned that acceptance of scientific observation is compatible with a solid understanding of the Bible. At NCSF, we understand that many questions arise for someone who has been taught that science and faith are incompatible, and we formed to have conversations for understanding with anyone who is seeking answers. Reconciliation is about making peace, and even the sharpest area of disagreement between scientists and the faithful can be reconciled, even the widest divide can be bridged. One can accept science and keep their faith. Faith in God is consistent with any and all scientific truth (and we will talk more about specific definitions for these agreements in upcoming posts). There are many faithful scientists that reconcile their belief in God and their work as scientists. That when understood, science encourages a deeper and stronger appreciation for natural law and our human place on earth. Evidence and observation are tools for understanding the way the natural world works. The pursuit of knowledge is the beginning of wisdom, therefore God wants us to seek answers, to have wise counselors, and to develop knowledge. It is in our best interest to seek truth. 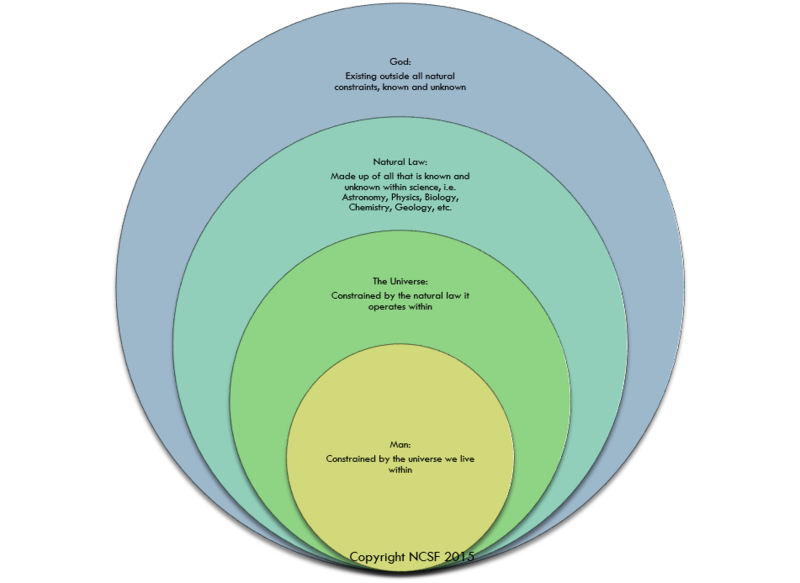 This overlain Venn diagram shows one conception of humanity's place in nature in relation to a creator's place in nature. Humanity exists within the universe which exists within natural law. If God set natural law into place, then it can be inferred that God would have to exist outside the boundaries of natural law. The outer circle represents a conception of God outside of time and unconstrained by natural law, allowing for a conception of God that exists both within our reality and also outside of human measurement or detection. Removing God from the diagram leaves one with a conception of humanity's place in nature without God. It is particularly useful to note that because God is not detectable, it can be rationally argued that there is no need for there to be a creator. Science detects natural law, therefore natural law is all there needs to be. That is all science was meant to discover - observable, sensory-based, measurable mechanisms that are testable and replicatable. The above framework is rational, and supported by the faith tradition that I am most familiar with, Christianity. In Hebrews 11, faith is said to be: "the assurance of things hoped for, (and) the conviction of things not seen." Sight is observable and measurable in the scientific sense. So when faith is employed, it relies not on a scientific journal for empirical evidence backed up through measurable and testable means. So it is through faith that belief in God occurs, not through our senses. If we had observed concrete evidence for the existence of God, then there would be no need for faith. The National Council for Science and Faith is taking questions from the public regarding science and faith issues. Please send submissions to: ihaveaquestion@scienceandfaithcouncil.org.